A Cinderella with no Buttons, Dandini or Baron Hardup, this alternative take from Phil Willmott may be pacy but it’s never fully engaging. 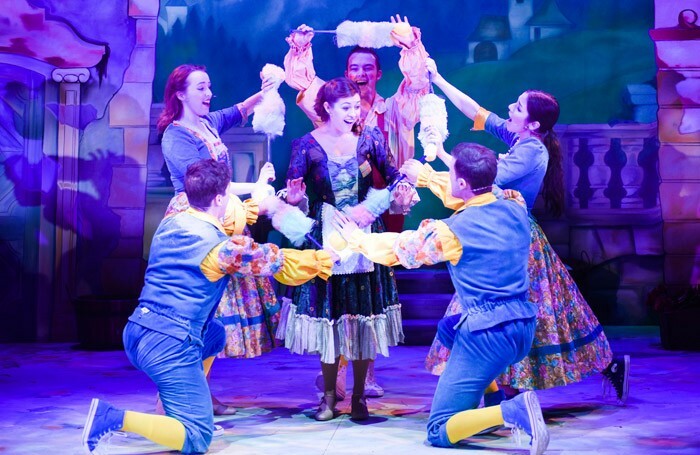 Emma Harrold’s appealing Cinders doesn’t appear on stage until 15 minutes into proceedings when she encounters Spud in the woods; Oliver Broad and Danny Stokes as the Ugly Sisters don’t get much chance to develop their selfish characters and Alastair Hill is underused as Prince Charming. It’s a pacy enough production with a number of strong songs and some fine singing from Hill, Murray and Harrold. Angela Laverick’s Fairy Godmother moves around enthusiastically and energetically but a lot of Willmott’s production is static and this isn’t helped by the adequate but cramped dances. Musical director Richard Baker keeps on top of the songs but it feels as if the story has been sacrificed. Guy Dickens’ lighting design is pretty much a flat wash; only in a couple of short-lived set pieces, in which he’s given a freer rein, does it feel like we’re watching a pantomime with ambition. The overwhelming feeling is one of safety. And the slapstick routine – in which the Ugly Sisters sing The Twelve Days of Christmas while Henry and Spud serve them a tamely calamitous breakfast – might need another look.